This report presents the results of a study to develop robust methods for determining the Environmental Flow Needs (EFN) of Okanagan streams, and provide information needed to customize the methods for 19 specific tributaries within the Okanagan Basin. The work represents Phase 1 of an Okanagan EFN-setting project. EFNs for specific streams will be established in future phases. 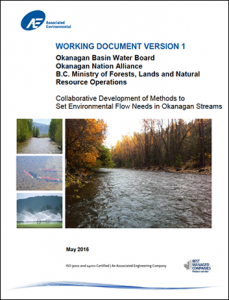 The Phase 1 study is titled: “Collaborative Development of Operational Environmental Flow Designations for Okanagan Streams”. The study proponents were the Okanagan Basin Water Board (OBWB), the Okanagan Nation Alliance (ONA), and the B.C. Ministry of Forests, Lands, and Natural Resource Operations (FLNRO). The work was completed by a consulting team led by Associated Environmental Consultants Inc., with the financial support of Environment and Climate Change Canada.